Worship and evangelism are inextricably intertwined, but the first is the goal and the second is the means. The work of worshiping God will form us to be bearers of God’s love to our neighbors. We will become the kind of friends who will give witness to the world. I am convinced that if our churches would really “Be Church,” our lives as individuals and our common life as a congregation would kindle in our neighbors a desire for such a relationship with God. In addition, if any nonbelievers came to our worship services (though they couldn’t technically “worship” since they wouldn’t know God’s worthiness) and if they observed how joyfully and attentively we praise God and listen His Word, they would probably be stirred and would want to learn more about this God and life. Our thankfulness, lament, confession, petitions and intercessions, and adoration could be quite convincing. Furthermore, genuine corporate worship inevitably spreads out into giving witness to our neighbors. Psalm 96:2b-3 underscores that expansion by describing our testimony with several parallel phrases. It is essential to remind us (since this isn’t evident in our English translations) that all the verbs are plural. We all—all the believers—are commanded to sing, bless, proclaim, and tell. Evangelism is not the work of the pastor, nor of the worship service. It is the task of every single Christian. —Marva J. Dawn, HOW SHALL WE WORSHIP? 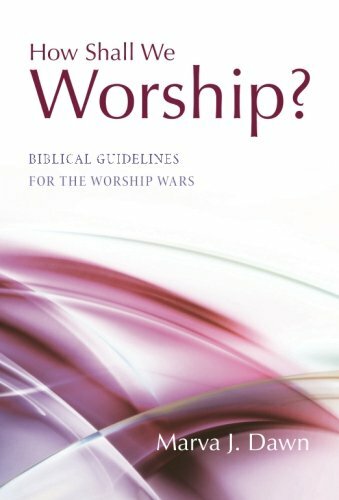 : BIBLICAL GUIDELINES FOR THE WORSHIP WARS, Chapter 4, “What Will Be the Result of Genuine Worship?” [Wheaton, Illinois: Tyndale House Publishers, 2003], p. 41. ISBN 0-8423-5636-3. In today’s WORSHIP QUOTE, theologian Marva Dawn shows how worship, although it is distinct from evangelism, is strongly linked to the church’s call to evangelism. Dawn develops this theme more fully in an earlier book on worship, A ROYAL “WASTE” OF TIME. If you are interested, take a look at it.